But the black, videocassette-sized device, with a 3-by-5-inch screen shown to the CES attendees wasn’t really working. Nonetheless, the first Newton product was at least nine months away from appearing on shelves (it would eventually materialize after fifteen months) and its capabilities were demonstrated in Chicago through software running on a desktop computer, a Macintosh IIci with a very special NuBus expansion board. This setup was originally created to facilitate the running of a self-contained Newton development environment on a Mac and was one of the many intermediate steps the project took prior to its definitive, palm-sized form. The computer+board setup was an interim solution to develop code using the Macintosh for input. Code was written in the Newton Toolkit (NTK) and then, using a program, downloaded to the board, where it would run. What would eventually go to the LCD display of the Newton was shown in a window on the Mac. In the same way mouse clicks and movements substituted for taps and other actions and gestures on the future PDA screen. The boards also supported some hardware features of the Newton, such as archiving data on flash cards. On the back edge of the board was a PCMCIA slot but, according to former developers, one had to put a piece of tape on the memory cards as a makeshift handle to pull them out of the slot. At least two type of boards were produced, sporting some and later all of the chips that would be used in the first actual Newton product, the MessagePad, known as the OMP (Original MessagePad). In both cases among those chips was an ARM CPU, a RISC processor created by ARM Ltd., an offspring from Acorn UK, the once successful maker of 8 bit computers in the 80s, such as the Atom and the Electron. Taking cue from the ARM chip the boards were named… ARMageddon and ARMistice. 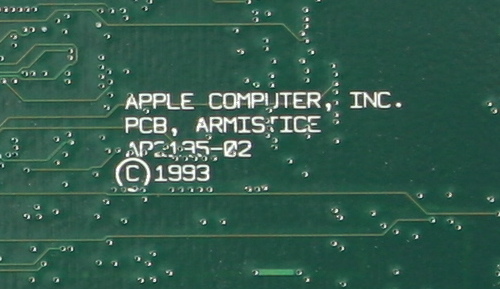 Created in 1991, the ARMageddon board is very sparse, featuring an ARM chip, RAM, four FPGAs and some chips to interface the board with the Mac. When the board is inserted, the Mac shows a funny splash with two characters running from an explosion. The ARMistice board is from 1993, and is much more complex. It is effectively a Newton on a board, minus the screen, obviously. Apparently there was at least another ARM board produced, named “ARMadillo”, but details are scarce. Apple apparently planned to produce these expansion boards in volume for developers, but supposedly only 50 or so were ever made. Not only the boards proved to be very expensive, but they were supplanted by prototype MessagePad devices, which could be used for hands-on development and testing. Apple switched to making smaller and less expensive “Universal Newton Adapter boards”, which didn’t include an ARM or much hardware and were conduits from the Mac to an external device. Note: The image is a (small) detail of a picture taken by Pablo Marx, available on Flickr and released with a CC BY-NC-ND 2.0 license.